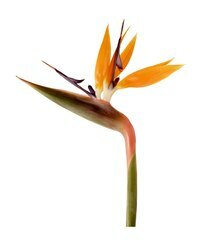 Bird-of-paradise (Strelitzia reginae), also called crane flower, is a semi-tropical plant native to southern regions of Africa. It produces ornate, colorful flowers on top of long stems that extend several feet above the plant's broad foliage. Bird-of-paradise thrives in the warmer climate of the United States, like the state of Florida, and it can be grown indoors in colder areas. It is vulnerable to several insect pests, diseases and environmental problems that can harm its leaves and other growth, causing them to turn brown and wilt. Fungal and bacterial pathogens can infect bird-of-paradise and damage the leaves and roots of the plant. According to the American Phytopathological Society, bird-of-paradise is susceptible to a variation of the Xanthomonas campestris bacteria, which causes yellow and brown spots on its leaves and stems. Xanthomas campestris is a species-specific pathogen with many individual strains that are evolved to infect specific species or genera of plants. Fungal root rot diseases can also turn green growth of bird-of-paradise brown by rotting the plant's root system, depriving its circulatory system of moisture and vital nutrients. Several insect feed on the leaves, stems and buds of bird-of-paradise, causing discoloration, deformed growth and possibly serious injury to the plant. According to the University of Hawaii, bird-of-paradise does not have many significant insect pests, but common parasites like mealybugs, scales and aphids can cause problems. Scales are a common threat to many ornamental and fruit-producing plant species in the United States. These tiny insects remain stationery on the foliage, stems and bark of their host for long periods of time. Scales and mealybugs both drain sap from the bird-of-paradise plant, causing new growth to turn brown or even wilt and die. The foliage and flowers of bird-of-paradise plants may turn brown in response to adverse environmental conditions, including toxic chemicals and unfavorable growing locations. High salinity levels or exposure to chemicals like chlorine and fluoride can cause portions of the plant to turn brown. Potted bird-of-paradise may experience problems once its roots outgrow its current container. If the roots become matted and tangled, they may be unable to transfer minerals and water to the rest of the plant. Transplanting a bird-of-paradise to a larger container or a location outdoors can solve this problem. Providing the proper care for a bird-of-paradise is essential to keeping it healthy and devoid of discolored or damaged growth. These plants require a regular supply of moisture to remain healthy, but they do not perform well in heavy, saturated soil. Soil that retains too much water can drown the roots of the plant and encourage the growth of fungal pathogens. According to the University of Florida, bird-of-paradise plants should be fertilized consistently and dead growth should be removed to prevent decay from spreading to healthy tissue. American Phytopathological Society; Leaf Spot and Blight of Strelitzia reginae (Bird-of-Paradise) Caused by Xanthomonas Campestris; A.R. Chase et al.